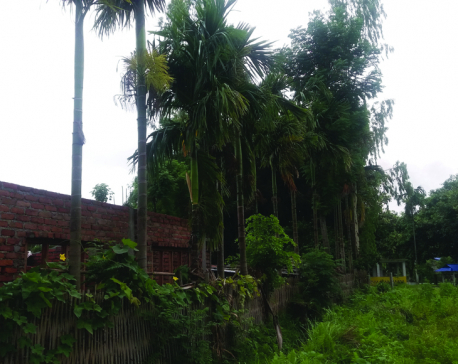 ILAM, July 17: The trend of encroaching upon forest land for settlement has been rampantly increasing in Ilam but the authorities concerned have turned a blind eye to this. Political pressure and government's negligence have turned some of the community forests into markets. Yet nothing has been done. It's been a long time since the District Forest Office (DFO) submitted the details of encroached forest land to the Department of Forest but no process has been started to punish the encroachers. After the formation of the local government, some policies were formulated for regulating community forests but they are yet to be implemented. When asked what should be done to curb forest encroachment, DFO has been repeatedly stating: "We cannot do it alone; we need support from other authorities." As per the details of DFO, 1,824.17 hectares of government and community forest has been encroached so far. Out of total 236 community forests, some have been turned into markets and settlement areas. Locals have been using the forest land for agricultural purpose too.Day by day, more houses and structures are being built in the forests. Yam Bahadur Rumba, information officer of the local forest office said, "We can make efforts to remove the newly constructed structures but need help of other authorities for removing the old structures." Rong Rural Municipality has introduced a law to vacate the encroached forest land but has not been able to implement it. Forest encroachment first began in the district in the year 1979/1980, say the officials of DFO. Reportedly, 700 hectares of land has been encroached upon in Danabari of Mai Municipality - the highest in the district. Similarly, encroachment has been intensified in Chulachuli Rural Municipality and Sandakpur Rural Municipality which are attached with the Indian border. Absence of committees to monitor community forests is leading to further encroachment, according to Community Forest Consumers Association. Meanwhile, Dhruba Shrestha of the Association claims that most community forests have not been encroached upon.A few years ago, there were yak sheds in Mabu of Sandakpur Rural Municipality but now the forest has turned into a village. Though some of the locals are ready to leave the land they have encroached upon, most are not willing to do so.